This picture is a perfect reflection of how we are trying to raise our daughter with multiple cultures and multiple languages. One foot lies on the northern side of the equator representing her North American (Mexican-American) roots while the other foot lies on the southern side of the equator representing her South American (Ecuadorian) heritage. This may be a stretch, but I think it’s an appropriate one considering our meager attempt to add a third language, but her lack of balance and her look of bewilderment represent how she, at this point in her life, needs our support to shape her identity as a multilingual and multicultural individual. As we prepared for our trip to South America, my husband and I were very unsure about how our baby was going to handle all of the changes. Not only were we stepping foot on a city with a greater altitude than our home in central Texas, but we were also immersing her into an entirely different culture for two weeks. Our little guaguita (which means baby in Quechua, the local indigenous language) seemed to have embraced all of the cultural nuances that came our way. Such as the numerous cousins that were always happy to hold, play, and entertain her. In fact, to our surprise she was more hesitant to have doting tios and tias hold her than the cousins, whom she willingly jumped into their arms with a smile. Sometimes it was a little difficult for me to decipher what made her North American roots distinct from her South American roots other than the constant use of Spanish, of course. The one conclusion I came up with was the way children, such as cousins, seem to grow up in such close proximity to each other. For example, we were staying with my husband’s cousin who lives right next door to her brother and his family! There’s also the luxury of affordable help in South America that seems to make the mundane day-to-day tasks of motherhood more enjoyable. I realized the amount of time and energy I expend day in and day out on chores that the “help” take care of for those that can afford them. I literally came back to the States telling my husband, “If we lived in Ecuador I think I would want at least three children.” That being said, as a doctoral student with an interest in advocating for bilingual education for minority populations, I was also very sensitive to how privileged my daughter was compared to the majority of the population in Ecuador. This probably will and can become very much part of her multicultural identity. I have realized the importance of making sure that I expose my daughter, not only to the rich cultures that she comes from, but to the fact that though she, to a large degree is considered privileged, it has not always been this way for her ancestors. I have realized that when it comes to raising multilingual and multicultural children we may also be referring to raising children with an awareness of differences in social class and education. What makes this especially challenging to teach is the pivotal role context plays depending on whether you are on the northern or southern side of the equator. I loved your picture and the symbolism it represents on your multicultural girl. Going back to our heritage countries always include an element of shock due to the many contrasts, but in the end the feeling is usually of joy for the memories lived and the time spent with family. Primos are always the best! So happy for you and hoping you get to do this every year!!! I second that emotion! Just came back from taking the kids to Mexico to see their grandparents for 10 days. Every single day I was struck by how wonderful it was for the kids to be with their cousins, aunts, uncles, grandparents, great-grandmother. Also the community, and such a strong ancient culture. I tried to express my gratitude but I sometimes wonder if they fully understand how special it is, what they have there. I just showed up with the kids, and the family did the rest. It was amazing. Within 10 days my 7-year-old stepson started keeping within Spanish most of the time (instead of avoidably mixing Spanish with English), my 9-year-old stepdaughter had learned how to speak properly with Ud. and my 3-year-old son had figured out there’s no limit to how many times a day he can say “lo quiero, Abuelito” or “gracias, Tia” and get a big smile from them. Suzanne, you’re light years ahead of me in figuring out the significance and meaning of it all. I just know it’s important, more than I can even understand right now. And I know I’ll do it again every year if I can. Thanks, Beth! It’s nice to know that they took to speaking Spanish once fully immersed. That’s something I think about when my baby gets older. The other day we were at the grocery store and she heard little kids speaking Spanish and I could swear that she did a double take when because she heard Spanish for the first time in a public place since we returned from Ecuador! Amazing. I couldn’t agree with you more, Ana. I guess I did experience a little bit of culture shock while down there. I just can’t get used to having people clean after me…it feels awkward, but at that same time I was very appreciative. It’s amazing to see the progress they have made in Spanish. When we first arrived they could understand, but they spoke maybe 5 words between the two of them. Now they’re fluent! Their language skills have exploded. I’m glad to hear about Ecuador. 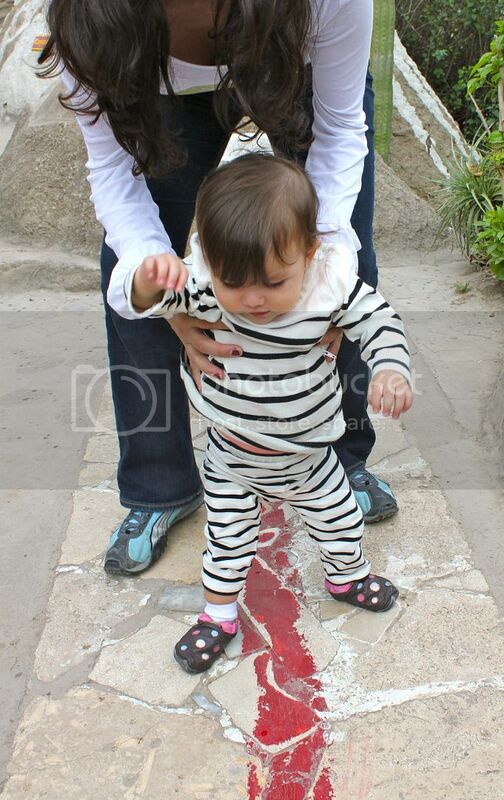 My family and I enjoyed our trip to Ecuador and we went to “La Mitad del Mundo” to have our picture: One foot on the Northen hemisphere and the other foot on the Southern hemisphere. We love it! Suzanne! I didn’t know you were part Ecuadorian! My parents are from Ecuador, and I would love to travel there more often with my son. Unfortunately, there’s not enough time in my schedule to do so! =( but you have inspired me to keep this on the radar, how amazing that pic of your daughter at the Middle of the World! Thanks for sharing your story and inspiring other moms!